Today we have a chat with soprano Sarah Coburn, who appeared as Rosina in Saturday's opening night cast for The Barber of Seville. The Seattle Times said her performance displayed "stunning vocal fireworks," and today we ask Coburn about her character, her on-stage jitters, and if her daughter ever gets to hear her sing those spectacular high notes. You’ve performed a lot of tragic roles in your career, but here in Seattle you’ve done more lighthearted productions (Die Fledermaus previously, and now Barber). Are you drawn to certain types of roles in particular, or do you try and keep a balance? I really don't make decisions based on whether the role is a comedy or tragedy; most of the bel canto heroines that I sing are rather sad victims. I have been singing Gilda non-stop for the last seven months, so this Rosina is quite a relief! I am also thankful that my roles in Seattle, so far, have been comic. It seems to help me to cope with the clouds and rain! You’ve said in the past that Rosina is the “straight man” in this opera—but she still certainly elicits many laughs from the audience. What’s your approach toward performing this role? Comedy is very difficult, because it is all about precise timing. I think Rosina can be funny, but the humor comes from her reactions to the situations, and not from an effort to try and be “funny.” It also helps that Peter Kazaras has allowed us to speak directly to the audience, sharing our various predicaments and inviting them into the situation. My favorite comedy of all time is Frasier, and what is so great about that show is that no one is really trying to be funny. Their reactions to their situations are what come across as hilarious. Sarah Coburn (Rosina) and Lawrence Brownlee (Count Almaviva) in Seattle Opera's production of The Barber of Seville. I’ve read that you’ve suffered from stage fright in the past. What’s that experience been like for you, and has your stage fright eased up over the years? Yes, I have suffered from stage fright, and I have no problem being completely open about it because my honesty can only help others who deal with it as well. One of the greatest investments I have made in my career was the time I spent working with Dr. Ellen Hollander, who was recommended by Renée Fleming, and who specializes in these issues. I also must thank my daughter for helping me to overcome so much of it, because I was forced to deal with these issues while I was pregnant. After she was born, I began to really live in the moment, for the first time in my life, and that is something that I have been able to carry over to the stage as well. In most of my singing in the past, I tended to worry about a high note or a difficult passage that would be 20 minutes away, and this forward-thinking would sabotage the musical moment that was actually happening. I am still working on really focusing on what is going on at the exact moment it happens, but I now rarely have to deal with that scary, judgmental voice that says, "Just stop singing, apologize to the audience, and walk offstage." Would you say it’s scarier to be on stage when you need to be funny and make the audience laugh, or when you’re in a more dramatic role? Or is it all equally nerve-wracking? I think I tend to feel more nervous when I am onstage alone. I love duets, and feel completely calm and happy when I have a colleague onstage. But I think the most comfortable moments for me onstage are during mad scenes, because I don't feel the pressure to look pretty, to stand still, to sound controlled or even elegant! Gosh, what does that say about me? Maybe I am crazy! 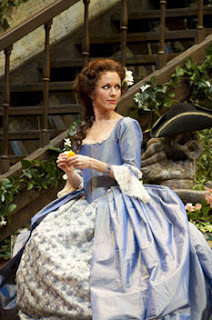 Sarah Coburn as Rosina in Seattle Opera's production of The Barber of Seville. You mentioned your daughter—how old is she? What’s it like being a mom when your career requires that you travel so much? Katie Rose is 17 months old and such a sweet girl. She has been with me on the road since she was 2 months old, and she is a great traveler. (I feel like I could write a book on the subject; I have taken her on 26 flights and 3 cross-country car trips!) It is a blessing that I am able to take her with me, and we have a wonderful nanny that travels with us. It is a difficult lifestyle, though. Finding balance and attempting to be a good mom, wife, singer, and employer is tricky. We are going to take some time off next season, and enjoy being at home with Dad. I can't wait! How does your daughter feel about Mom’s voice? Do you ever sing to her? I don't sing that much opera at home—mostly lullabies and hymns at bedtime. The one time I attempted to really sing an aria in her presence ("Martern aller Arten"), she burst into tears! But I do warm up at home, and she imitates me. We have a funny video of her vocalizing at 3 months old, and I think she is definitely a coloratura! A phenominal coloratura achievement as Rosina Saturday. I knew Larry Brownlee would be great; I experienced him as Almaviva in Katharina Thalbach's laugh-a-minute production at the Deutsche Oper Berlin, so he was no surprise here, but Ms. Coburn matched him marvelously!! I'm looking forward to experiencing them again tonite (the 19th)!!! Ms. Coburn mentioned Renee Fleming; I'm now reading Fleming's most informative book about hao a career as an opera singer develops, with all the problems (including stage fright) along the way and how she dealt with them. I'd HEARTEDLY recommend Renee Fleming's "The Inner Voice" for anyone interested in hpow a career as an opera singer develops. Fleming also compliments Speight for his ability to find and develop young opera singers!! It never fails to impress me how easily stage actors like these overcome public speaking fear. I mean, just talking to a crowd is hard enough - let alone acting.